The second quarter continued to march in a similar vein to the first this year with muted volatility and international markets outpacing domestic markets. Highlights in the period include another 25bp increase in rates on Fed Funds, but more notably the Fed’s announcement for plans to reduce its balance sheet, likely to begin later in 2017. Globally, a presidential win by Emmanuel Macron in France and President Trump’s announcement to withdraw the United States from the Paris climate agreement created moments of pause on the international stage but did not deter steady growth. The World Bank forecasts global growth to reach 2.9% in 2018, up from 2.7% largely due to increasing trade volumes, improved outlooks for commodity export dependent countries, and broad gains in the US and Europe. Earnings from earlier in the quarter and initial results from the banks over the past couple weeks continue to demonstrate the recovery in the US. This has been even more pronounced in Europe which has outpaced domestic earnings year-to-date. Despite President Trump facing significant headwinds to execute on his proposed healthcare and tax reforms, domestic equity markets maintained their upward trend with exceptionally low volatility. The VIX fell to a low of 9.67 in early May marking its lowest close since December 1993 and has remained low through the end of the quarter. Healthcare and technology have been the clear winners thus far in 2017. The healthcare sector performance can be attributed to cheap valuations after poor performance in 2016, considerable improvements to company balance sheets and cost structures, as well as a continuation of strong demand. Regulatory uncertainty is the greatest risk at the moment as the administration attempts to repeal the Affordable Care Act. After the quarter, late in the evening on July 17th, Majority Leader Mitch McConnell announced the GOP’s need to abandon the health-care bill given the defection of four GOP senators. On the other side of returns, positive earnings of energy companies this year haven’t been enough for the sector to move into positive territory, closing out Q2 (12.6%). The US ramping up production with rig counts increasing faster than anticipated has more than offset OPEC’s continued production cuts through 2018. As such, oil is down approximately (17.5%) year-to-date. Furthermore, large capitalization over small capitalization and growth over value remained the story for the first half of 2017. The trend has been propelled by mega cap technology companies such as Facebook, Apple, Amazon, Microsoft and Google (“FAAMG”), which accounted for the vast majority of S&P 500 performance YTD. International developed and developing markets continued their strong performance. Europe continued to show signs of recovery gaining traction with strong corporate earnings. Investors took advantage of this trend as net inflows into European funds hit a five year high in Q1, according to Thomson Reuters Lipper, and net flows through April were at two year highs. Political elections throughout the world have held investors’ attention and the decisive win by centrist Emmanuel Macron over alt-right Marine Le Pen in France was no different. Concerns of France leaving the EU were abated with his win and his proposals to loosen Labor rules and increase ties with the EU bolstered the market. In Britain, Prime Minister Theresa May’s call for a snap election backfired as Conservatives lost ground in Parliament. The results indicate a softer Brexit compared to May’s hard Brexit plan. While there is no specific demarcation between the two, it is more likely that Britain will keep some ties with the EU whether through maintaining a single market or some degree of free movement. Emerging markets soared in Q2 with improvements in global growth positively impacting the developing world. Strengthening outlooks for commodity-focused countries such as Brazil, Nigeria and Russia bolstered the region’s performance. Additionally, the OPEC agreement to adhere to oil production cutbacks through 2018 further aided the positive market direction. However, there remain challenges, notably in China and parts of the Middle East. Moody’s cut China’s sovereign credit rating, the first downgrade for the country since 1989, citing rising debt and a slowing economy. S&P remains unchanged at this time. Additionally, Saudi Arabia, Egypt, Bahrain and the UAE cut diplomatic and some commercial ties with Qatar. Saudi Arabia places culpability on Qatar for the financing, adopting and sheltering of extremists. Thus, the four countries closed off air, sea and land routes to Qatar and denied access to its aircraft and vessels from using airspace and territorial waters. This places the US in a tough position as the largest US and allied military base in the Middle East is in Qatar. Bottom Line: While we remain positive on equities and economic fundamentals, high returns will be harder to achieve in the short to intermediate term without significantly higher GDP growth. Growth oriented portfolios should continue to maintain a healthy allocation long term but be more selective around specific sectors and regions as we expect greater relative volatility from continued political and macro-level activity influencing global markets. Chair Janet Yellen and the Federal Reserve maintain their stance that the US economy will see continued growth, permitting additional rate hikes while emphasizing a gradual approach. As such, the Fed announced raising rates to a target range of 1%-1.25% on June 14th. This marks the third increase in 6 months and second increase in the 2017 calendar year. During her Congressional testimony, Yellen stressed the importance of core inflation and highlighted its movements as the primary driver for additional hikes going forward. Core inflation decreased slightly to 1.4% in May and the FOMC wants to see that improve to have inflation consistently run at or above their 2% long-run objective. 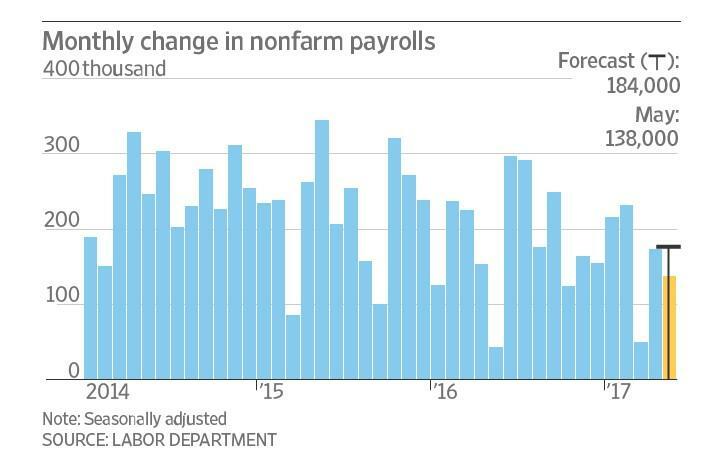 Furthermore, the above chart highlights the Fed’s announcement to significantly reduce its balance sheet by the end of 2022. Today the central bank’s balance sheet is roughly 5 times the size compared to pre-crisis days. Starting later this year, the Fed will allow up to $10B/month in securities to roll off with a cap of $6B in Treasuries and $4B in Mortgage Backed Securities. The caps will increase every three months by the cap amount until reaching $30B and $20B, respectively. In Europe, the ECB announced on June 8th that there would be no interest rate cuts at that time keeping the base rate at 0% and deposit rate at (0.4%). However, at the end of the quarter the Euro surged 1.4% from comments from ECB President, Mario Draghi, stating that “deflationary forces have been replaced by reflationary ones”, and “all signs point to a strengthening and broadening recovery.” The markets took those comments as the ECB taking their foot off the gas pedal with stimulus. Draghi had to come out later in the week to comment that markets took his remarks out of context. Bottom Line: Traditional fixed income offers limited return expectations as rates continue to rise and central bank tightening weighs on bond markets. We have shifted significant fixed income exposure toward floating rate and idiosyncratic credit and believe that active managers will be best positioned to capitalize on uncovering pockets of value across the yield curve. Liquid alternative performance was mixed in Q2, depending on the underlying strategy and asset class the fund employed. While distressed and macro hedge funds were down slightly for the quarter, event-driven, hedged equity and multi-strategy funds put up respectable results exceeding 1%. Macro allocations have struggled recently due to the aforementioned historically low volatility. On the other hand, strong equity markets and a significant increase in IPO activity so far this year have benefitted event-driven and equity hedge the most. Massey Quick Simon has spoken many times about the transformation in the hedge fund industry over the last several years. Since the financial crisis, the S&P 500 has outperformed just about everything else making it easy to dislike a hedged product. With that in mind, when volatility picks up, hedge funds should protect on the downside. We maintain the view that hedge funds are an important part of asset allocation. We are aware and focused on concerns of increased crowdedness of trades amongst managers, resulting in similar, muted returns. The hedge funds that invest in niche opportunities and differentiated securities continue to generate excess returns and are garnering institutional and sophisticated retail interest. They remain poised to do what we expect hedge funds to do, which is to generate uncorrelated alpha, diversify the portfolio and protect on the downside. Bottom Line: We believe that the evolution of capital markets has created a variety of challenges for liquid alternatives (hedge funds) to generate outsized returns. We are more selective than ever in building allocations to hedge funds and primarily view an allocation to the asset class as the “risk managed” component of multi-asset class portfolios where clients can gain hedged exposure and short alpha during choppier periods in capital markets. We believe they will be beneficial to portfolios when volatility picks up and as a result, hedges will be an important component to reducing overall portfolio level risk for investors. 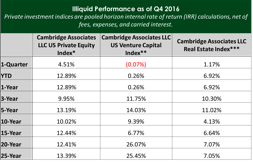 According to Cambridge Associates, private equity performance increased by nearly 75 bps from Q3 to Q4 2016. Conversely, real estate slowed modestly and venture capital dropped from positive 3.3% in Q3 to slightly negative (0.07%) in Q4. Preliminary Q1 results show a turn-around in both real estate and venture capital performance, generating 3.5% and 3.3%, respectively. The opportunity in Massey Quick Simon’s view is to invest in the smaller, niche and under the radar illiquid opportunities. In general, private equity multiples have increased over the last few years. However, as can be seen below, entry multiples remain low for smaller companies as they have not seen the same increase as larger companies. For example, a buyout multiple for companies with enterprise values from $25M-$100M is 7.8x EV/EBITDA whereas it is just 5.6x for companies under $25M. Investors that specialize in smaller businesses benefit from less competition and more upside potential. Bottom Line: Over the last several years we have been adding to our roster of illiquid opportunities including, but not limited to, traditional private equity, venture capital, middle market lending, real estate and distressed. We believe illiquids are less affected by turbulence that exists within public markets and will be able to generate significant alpha over time. We expect the illiquidity premium to generate 300-500bps of alpha per annum over public market equivalents.